Our teaser trailer is now almost complete. All that is left to do is insert a voiceover. This past week, I have spent most of my time trying to find some music for the second half of the teaser trailer. This section is a montage of images that feature Nick with the three different girls, and music needed to be romantic yet happy at the same time. I found it quite difficult to find a song that matched this on Jamendo (the free music download website). However, I eventually found the song below and feel that it fits in well with the section. I did not think it would take that much time to try and find music to fit in with the different scenes in our trailer, and I probably should have taken this into account whilst creating my timeplan as it took much longer than expected and put me behind a few days. Recently, I have also been creating the first draft of my poster for our film. Below is a photoshoot plan that I made, which made it a lot easier for me when I actually came round to taking my photos, as I knew exactly what I needed to photograph. I feel that this poster is quite a good first draft, but there are many changes that need to be made to make it look much more professional. These changes will be discussed when I make my second draft for my poster. I feel that one of the reasons why the poster above was not as successful as I wanted it to be was because I had not created a mock up for it. It is essential to create a mock up as it gives you a much clearer idea as to what your final poster will look like. It also allows you to play around with the layout before you start inserting pictures and text and everything is final. Below is the mock up for my second draft of the poster. Whilst creating the first draft our my poster, I also began thinking about what other publicity our film could get to make sure that it receives as many viewers in its opening week as possible. There are many visual ways of advertising a particular film, such as the TV, magazines, billboards etc, which all appeal to a huge amount of people. 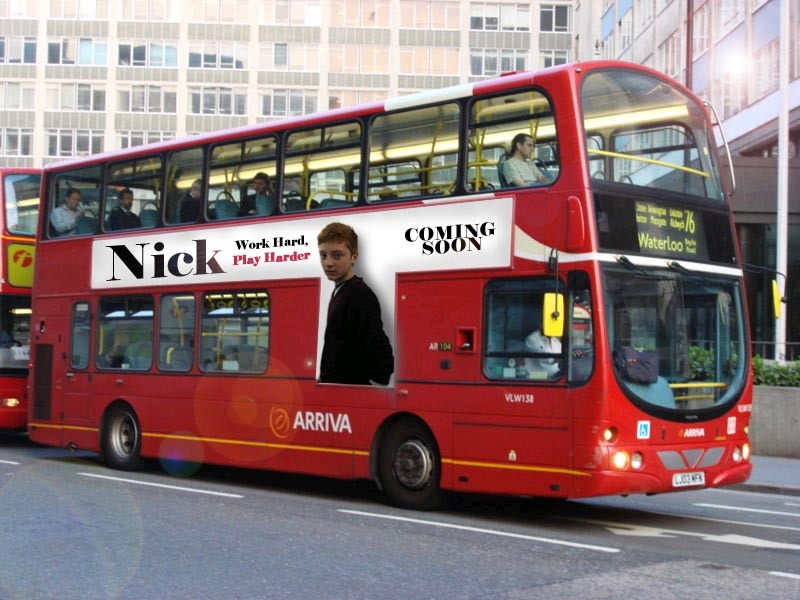 However, personally I feel that one of the main forms of advertising for films that are soon to be released is on the sides of buses. Buses are constantly running in and around central London, and at busy times such as rush hour, people are very likely to look at them. Therefore I have used Photoshop to place an advertisement for our film on the side of a bus and also at a bus stop, to see what it would look like if our company decided to advertise there.